The Department of Health is encouraging the public’s participation when it hosts its ‘Fitness in the Parks’ initiative, which kicks off on 20th August. The Department has partnered with local gyms to host this series of free lunch time exercise classes to be offered Monday – Friday from 12:30 – 1:15 PMthrough 14th September, 2018. Classes will be held in Victoria Park or Barr’s Bay Park. 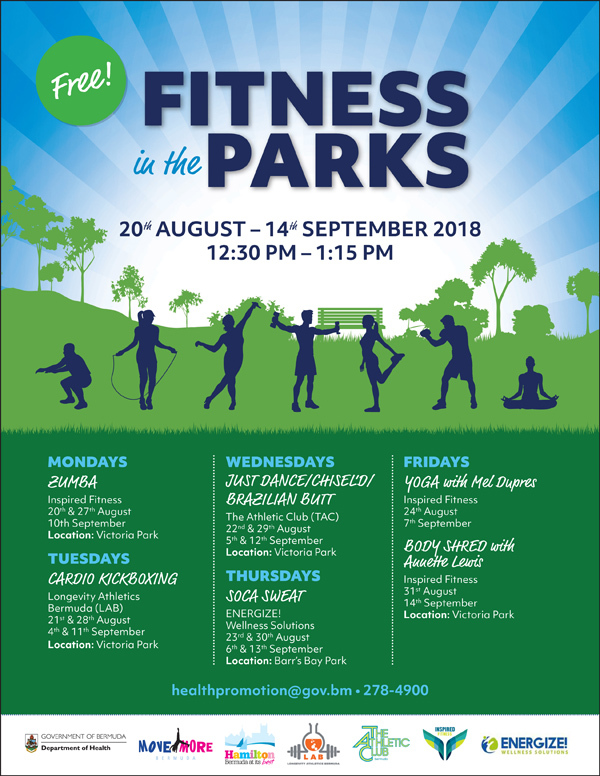 The Department of Health is hosting Fitness in the Parks as a lead-up to their Celebrating Wellness event on 26th September, 2018. “The Department hopes to promote the important role that physical activity and healthy eating play in achieving a healthy lifestyle and expose attendees to community organizations that share in these initiatives,” a spokesperson said.